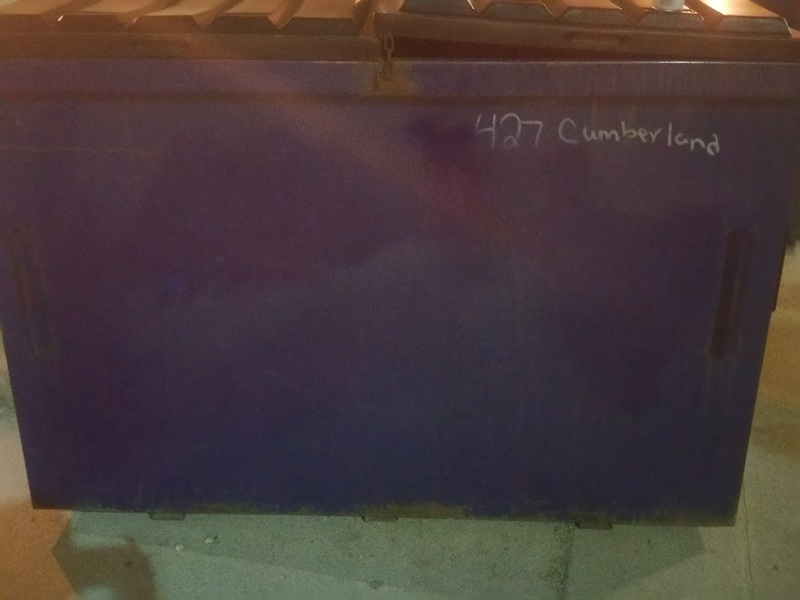 As discussed many time before, Murdoch Management has consistently demonstrated, and continues to demonstrate a disregard and lack of care for the property under their management at 435 Cumberland Ave, ever since the building opened in or around 2005. Also as discussed before, Murdoch Management has demonstrated that they prefer to wait for an order or complaint to come in before dealing with an issue. In effect I am managing the property on behalf of Murdoch. 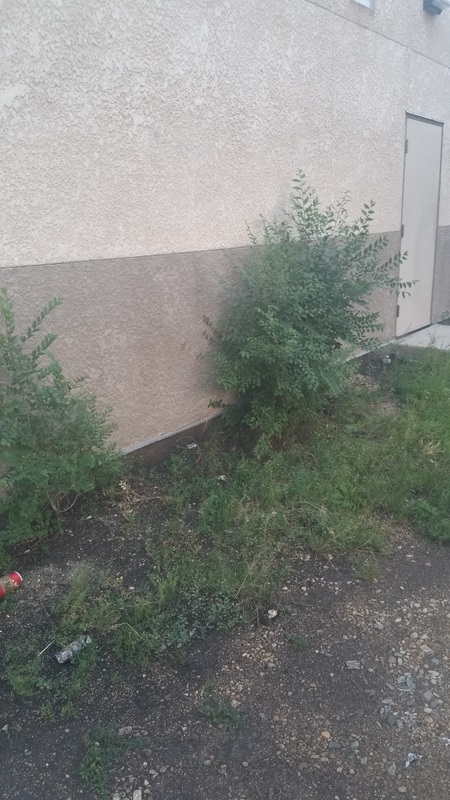 The issue at this time is uncontrolled weeds on a part of the property that has been neglected ever since construction. The weeds have never been controlled, unless you call mowing them once per year "controlled". Details, photos, and documentation available upon request. The weeds are now taking over our lawn at 427 Cumberland Ave. Every year we have less grass and more weeds that migrate from 435 Cumberland to our property. I'm currently referring only to weeds. The mattresses, furniture, and bags of garbage opened and spread across both of our properties are not the issue I'm focusing on at this moment. 8(1) Plants and vegetation must be kept trimmed so as not to become unsightly. cultivation, turf must be kept trimmed to a maximum length of 15 cm (6 inches). 8(3) Noxious weeds must be controlled on all properties. We got tagged today, I cleaned it up immediately because I will not abide that stuff on my turf. 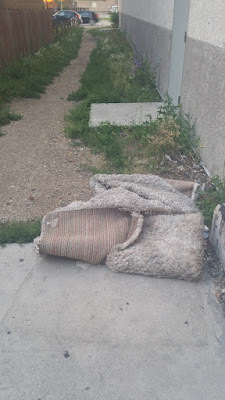 This carpet showed up shortly after the furniture at the beginning of June. It's now been six weeks. Also Murdoch's weeds are taking over our lawn and garden, we are losing ground. Historically Murdoch Management has nothing to say other than please advise us of issues; there's no movement toward actually looking out for their own issues on their own property. Murdoch is not aware that the garbage was not entirely cleaned up on July 3, nor have they looked at their weed situation even once this year. There are cameras recording at the location, but in all our years of communication with Murdoch, they have always refused to go refer to their own recordings. After six years, we don't see Murdoch Management having any intention of watching out for the state of their property. Sometimes things are dealt with when I speak directly with Murdoch, but it's hit and miss (and we have a logbook of all the hits and misses). Murdoch's only solution is for me to report issues to them, I guess it's nice that I'm able to do their legwork so that they don't have to expend their own resources. Currently we have guests of the Royal Winnipeg Ballet staying at our place, and tourists from Brazil, and we are greatly distressed that they must walk by this filth and trash every day, but as we've said ever since 2009, it's out of sight and out of mind for Murdoch. In the past, we've had plenty of communication starting in 2009, which has been fruitless and without effect. Our efforts have been exhausted, and it's not reasonable to expect more of the same. In the future, I may or may not provide warning to your company when I take action, unless Murdoch conceives and implements a plan to care for their property proactively, and not reactively. It's been a month since the entertainment unit has showed up. It has since been joined by other pieces. 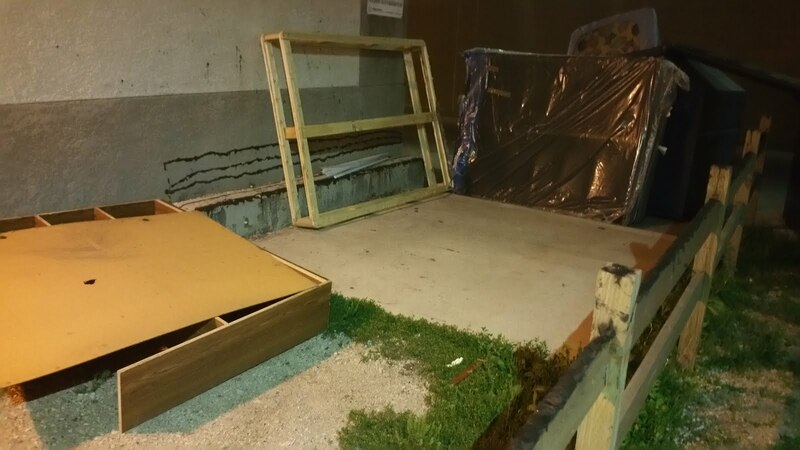 A week after it arrived, the glass in the unit was smashed and distributed around the area. We were pleased to host the Deputy Police Chief of Fargo with his family here at our place for the duration of the FIFA games. 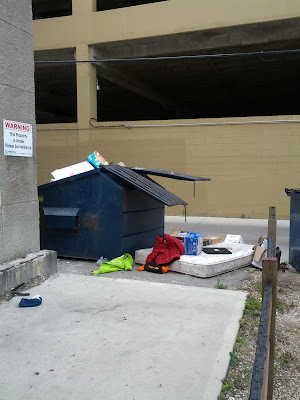 We were distressed that he and his family had to walk right by this garbage every day as they were going in and out. This is just one of our many international visitors that come to Central Park... and these are the images that his family took home when they departed. We had really hoped that Murdoch would have cleaned up their garbage prior to that, but there was no action, which is consistent with their history, as per the previous reports and photos we have submitted. 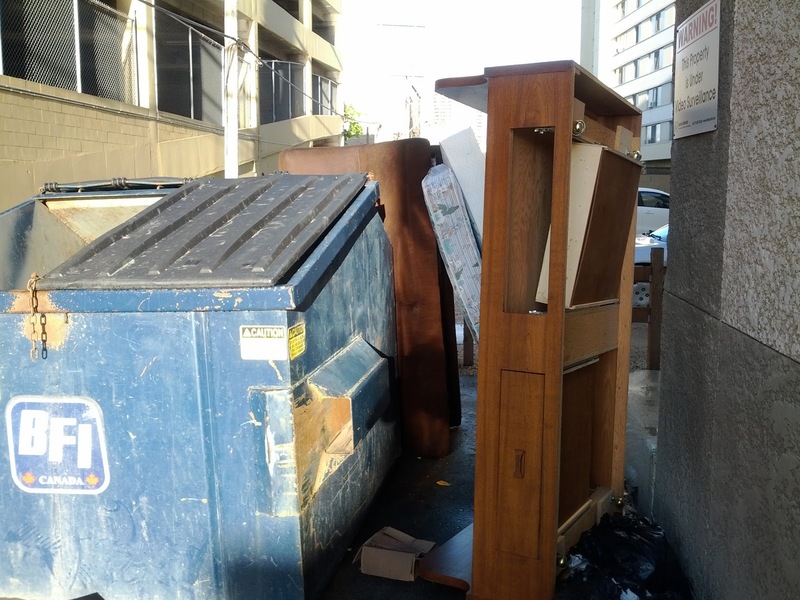 I will give it a couple more days, and then I will deliver all the garbage to Murdoch Management's office so it will be easier for them to deal with it, and I will invite the media to watch me deliver it. 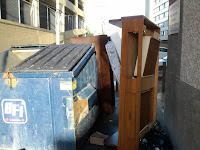 I don't know if it's incompetency, or lack of management skills, or financial mismanagement, but it breaks my heart to see a lack of care and attention to their own property, to their neighbours, and to the neighbourhood. This is exactly the attitude that is wrong in parts of the city. 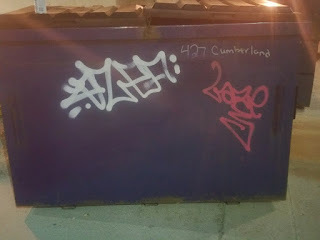 I continue to hope and pray that we get a responsible management company into 435 Cumberland who will care about their property and seek the welfare of the community. The next issue we'll deal with are the weeds on 435 Cumberland, they are really high again... not sure if they're by-law high, but they're pretty high. On the weekend, there was a really big wedding at City Oasis. 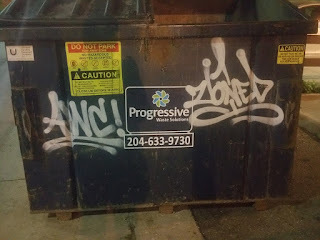 With tons of garbage. 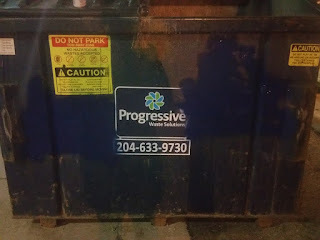 Somebody tried to throw all their garbage into our dumpster and overflow it, but we did not allow it, because we're already struggling with our own garbage, we haven't had a garbage pickup in 3 weeks. So the garbage overflowed at City Oasis, it was a horrible sight. The next day, many of the garbage bags had been ripped open and stuff was strewn about, including all over our lawn and garden. 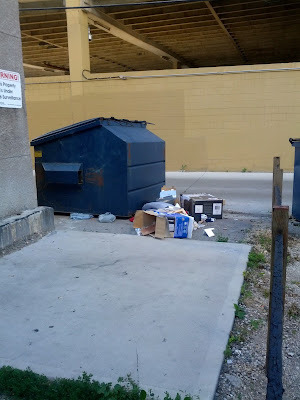 But Tuesday morning, BFI came and emptied out their dumpster, and Tuesday afternoon someone came and cleaned up all the garbage lying around, and did a pretty good job of it. So this is starting to look like a good pattern... and we are cautiously optimistic that it is a sign of good things to come. Miracle of all miracles! 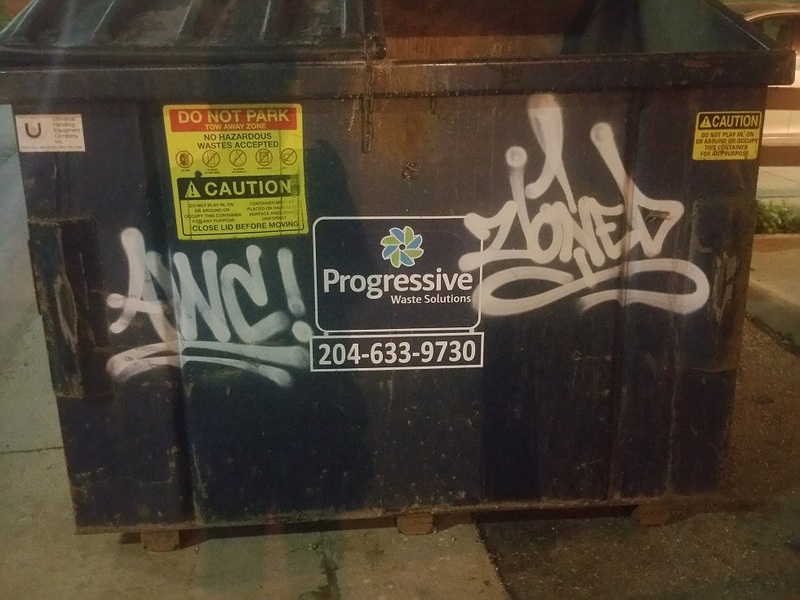 Somebody moved pretty stinkin' FAST! 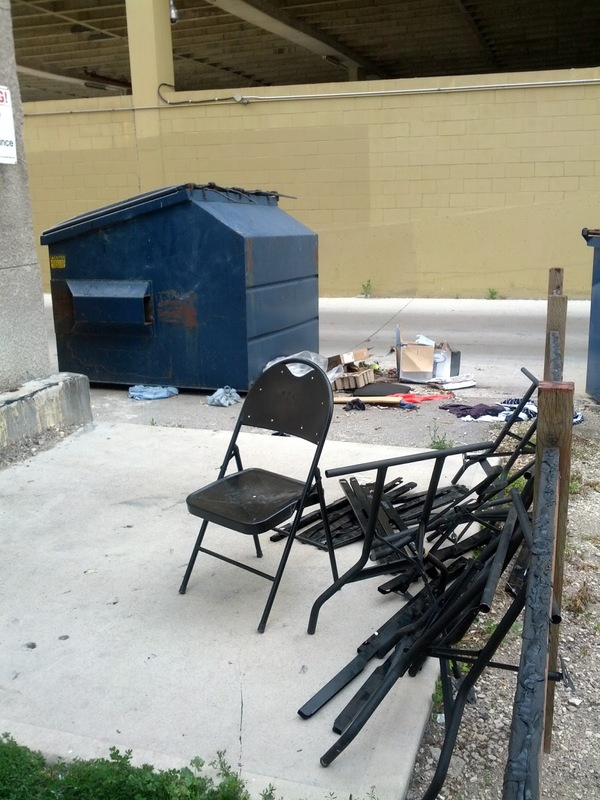 Furniture showed up again yesterday, and within 24 hours somebody was there to take it away! I can't even believe it, they picked it up before I even posted these pictures! Have we turned a corner? Did somebody somehow get motivated to do their job? Did some money miraculously make its way into the budget? Is the professional property management company managing the property professionally? It is too early to tell... we've only been working towards this goal for four years... we'll watch for four more years and see if this care continues. How can a property be managed if nobody's paying attention? 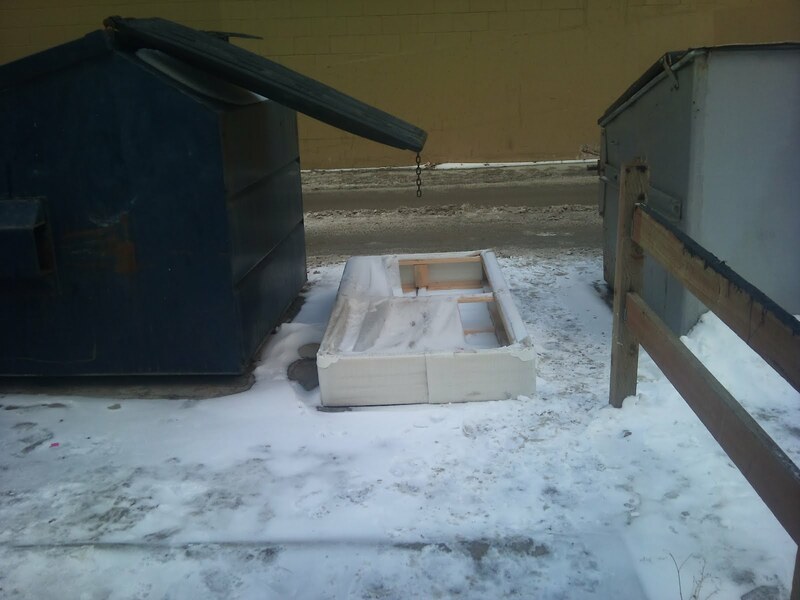 Here's a bed that's been lying there for three weeks. It started near the dumpster/pad, then moved to the middle of this abandoned tract of land behind 435 Cumberland Ave. It got moved around from time to time, at some point it lost it's legs, and then it ended up, torn up, in this position. I thought I'd ignore it for a week. Then I thought I'd give Murdoch Management the benefit of the doubt and leave it for another week. Then I thought I'd see if they took care of it the week after that. But no. Because there is no budget to have someone actually walk around their building to look and see what the needs of the property are. So what is a person to do about things like this? To quote Murdoch Management, "What is the answer? I don't know. The answer may present itself next week..." We will now be entering our fourth year of trying to work with Murdoch Management to deal with the issues on their property, and at this time, we have no indication that anything productive will be happening at any point. They seem to be waiting for the answer to fall from the sky. Bed arrived approx Feb 1st. Was removed approx March 19th, for a total of 7 weeks. 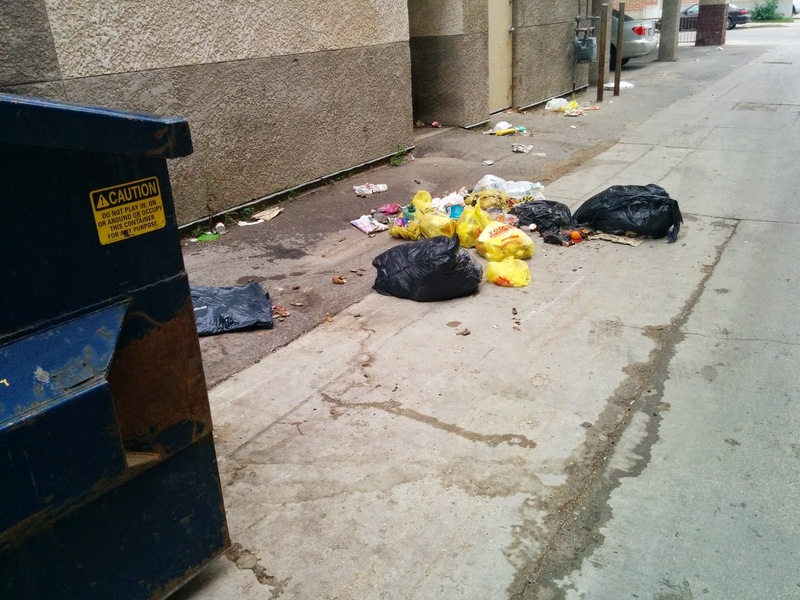 There's been some garbage lying around again behind 435 Cumberland ave, and the bags have been ripped open and garbage spread around. The wind blew it all over, down the lane, and onto our property. I was rudely surprised this morning when I headed out to work by all the garbage that was blown over, and I got really ticked off by it. It also really ticks me off that, whenever Murdoch has a problem and they don't have the ability to take care of it, it becomes our problem, and we have to take care of it! We can't even count how often we've had to pick up garbage belonging to 435 Cumberland. Still, after three years, Murdoch is trying to fix these problems without adjusting their budget, without spending money, and without going to too much effort. In other words, nothing has happened, nothing has changed. Except that they removed the cat litter that had been keeping the drunks away. What a winning move that was. Well it's been quieter lately behind 435 Cumberland ave, less people drinking, better garbage control. There was another violent guy who tried to kick his way into our building, but he didn't break anything, just left some footprints on the door, so it wasn't as big of a deal as last time. There's been some scary african gang-type people back there making noise at 2am, we leave them alone. Oh no! Someone came and removed all the kitty-litter on the pad! For the last few years, Murdoch couldn't be bothered to pay attention to this piece of property, but now that there was a partial solution to the problem, somebody got motivated to start cleaning and they removed the solution! I wonder if it's possible to source some used kitty litter somewhere. 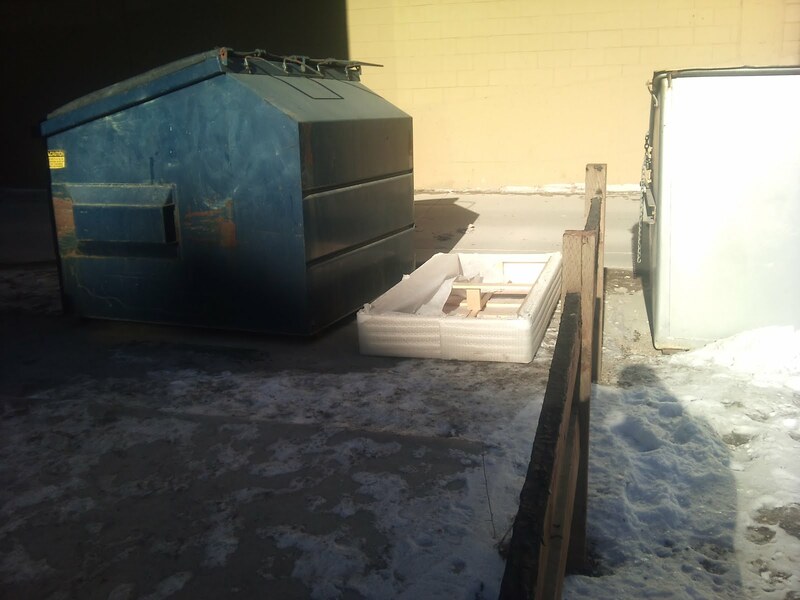 *Update* We did actually find some used kitty-litter to put down, but it was so gross, we couldn't bring ourselves to do it. This has been an incredibly rare sight. Ever since the kitty litter was put down on the pad, there has been almost no one drinking here. It's been wonderful! Only twice have I ever seen anybody sitting on the stuff. And the acousta-seal on the fence (the black goopy stuff you see on the brown fence boards) seems to be doing wonders as well. We're really happy with how things have been quieter lately. There are still people who will stand around and drink back there, but not as many, and they don't stay around as long. Who owns this place anyway? 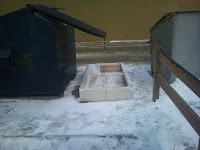 Lately I've noticed that the drinkers have gained a real sense of ownership of the City Oasis dumpster pad. Whenever we try anything to prevent them from drinking between our buildings, they get angry specifically at us. I understand that Murdoch Management has allowed them to sit here for a few years without incident, and that they have learned that they come to no harm here, there is no resistance to them coming here to drink. This is the first wrong that has been committed by the property management. This sense of ownership that I'm feeling from the drinkers is really upsetting. 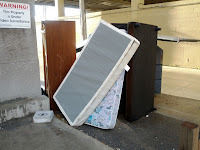 The belief that these drinkers have that they deserve to be able to drink here, to take up residence on both of our properties, and that we are the offenders when we try to protect our property, this is the second wrong that has been committed. I'm not even sure if I can put my finger on exactly why this is so upsetting... but it is! This sense of ownership is just really wrong! It's for these reasons that our property is at risk, our people are at risk, and our business is at risk. It's for all these reasons that I continue to fight against this stuff, and I am continuing to draw upon any resources that I can find. If anyone has any more ideas for me, please email me! It seems someone else has also taken offense at the patrons of the pad. 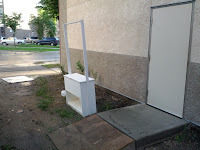 We found the ledge covered in used kitty litter, which I think is an awesome idea, and I think it'll be really effective. I think it's interesting that someone has compiled this much used kitty litter, and it makes me wonder what sort of person this is who has so much used kitty litter to spare... anyway, I do appreciate the effect it has on the pad, I really think it's helped to keep down the traffic there over the last couple of days. I'll try to post a picture here asap. For those who suspect that it was someone in our building who did this, nobody in our building has pets, the last one died a number of years ago. I see that I've got some people following my blog and commenting. This is good to see. But don't be rude! P.S. I created an email address for myself here, just because I can. It is info@murdochmanagement.ca, please feel free to drop me a line, send me anything you want. I don't have pictures of him drinking, but we did find his King Can after he left. So we are continuing to document this stuff to bring to my lawyer. The last time I talked to him about this, he said nothing can really be done until some damage has been done to our property, then it's legally considered a nuisance. And that milestone has now been reached.